Viewing topic "Can’t get audio from MOXF recorded in Reason 10, only MIDI"
Propellerhead says I have to configure MOXF6 to do so. 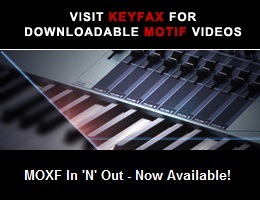 - I can use MOXF’s A/D Input to record audio from bass, guitar, mics etc. What I can’t do at the moment is record the audio directly from the MOXF. Please note that MOXF is connected via USB, so I’m trying to do this without having to change cables and connections. Have you installed the appropriate Yamaha Steinberg USB Driver on your computer? Yes, I have the latest Yamaha Steinberg USB Driver installed. I don’t use Reason, so I can’t be specific. However, do you have the YS USB Driver selected as the ASIO driver in Reason? The moXF should appear as an audio input in your ASIO settings (you need to enable ASIO to be able to record the audio). I have reason installed, but I haven’t tried to record the moXF through it. Hope this helps. I can use MOXF’s A/D Input to record audio from bass, guitar, mics etc. Please note that MOXF is connected via USB, so I’m trying to do this without having to change cables and connections.! If you can already record audio from basses, guitars and mics via the MOXF’s A/D input to Reason, you might not know that the voice audio from the MOXF defaults to USB outputs 3 & 4, instead of 1 & 2. The solution should be to make sure that the inputs of any audio tracks you want to record MOXF voice audio on are set to 3 & 4. Thank you all for the help and patience! philwood, this is exactly what I needed! Thanks!